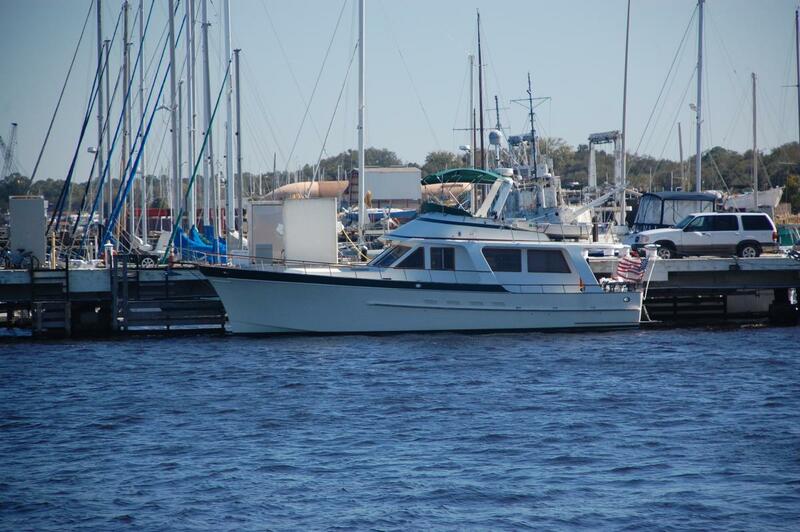 Do you recognize this motor cruiser? Spotted this rather elegant looking motor cruiser a while back, from across the basin at Reynolds Park, in Green Cove Springs, FL. It's a maddeningly familiar profile, but I just can't ID the designer / builder. I give the question less than an hour on TF . . . Excellent call, Tolly Roger, and impressively quick - even for the Trawler Forum. Thanks! Sure enough, that's what she is. Evidently built by Cheer Men Marine in Taiwan. I wonder if the design was by an individual whose portfolio we might recognize. The lines are rather distinctive. The first link shows in the description that it is an Ed Monk design. Boy! Those PT 41s share lots of detail with our Fu Hwa! The ad says "Ed Monk style". That does indeed look right. I would not have bet on it being an Albin. Who designed it, I still wonder?